In July 2015 we were approached by Bert-Jan Kosters, a woodwind and brass musical instrument repairer and retailer from the Netherlands. 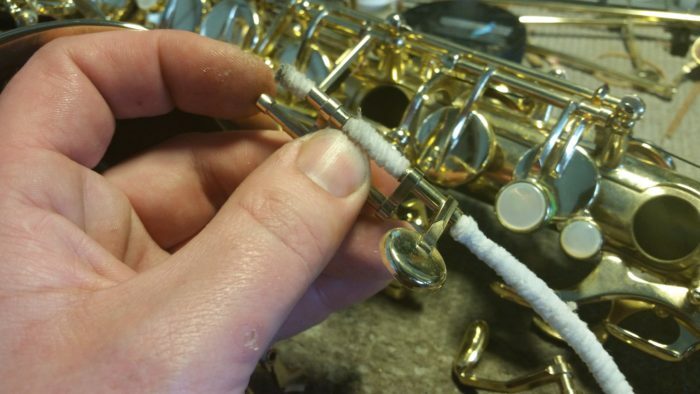 Bert-Jan found us because he required a pipe cleaner capable of cleaning various diameter parts of instruments, without damaging or scratching the surface and finish. After sampling various pipe cleaner options in a selection of instruments from clarinets to flutes, and from saxophones to trombones, it became evident that two bespoke products were ideal for cleaning the various musical instruments ; a 3mm wide x 5m long Fleece Pipe Cleaner Coil, and a 6mm wide x 5m long Fleece Pipe Cleaner Coil. The two pipe cleaner coils enabled Bert-Jan to cut pieces to his required lengths to clean the small hinged tubes of woodwind instruments or larger diameter holes, such as the valves on brass instruments. The fibres on the coils were made from a lint-free microfiber fleece, ensuring the absorption of oils and moisture from the inside of the instruments, without any shedding. The soft microfibers also protect the paintwork and brass from damage, which is vital for this hi-end, specialist type of application. If you have a specialist application that you think could be solved by pipe cleaners, please CONTACT US today to begin the sampling and quotation process.